Teachers around the state negotiated with local districts for some of the biggest raises in recent years. That presents new challenges for lawmakers struggling to devise a way for the state to pay the full tab for teacher salaries. 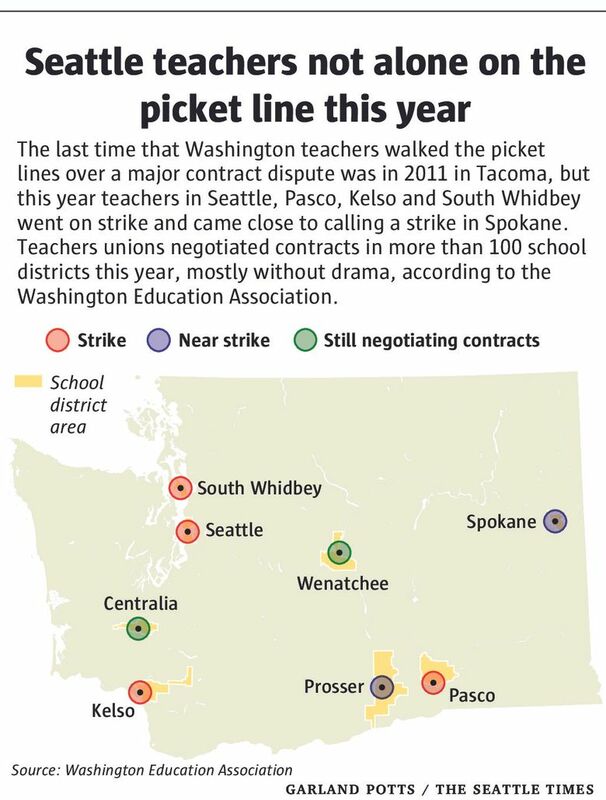 After four years without a major teacher strike over a contract, Washington State had four this summer — in the Seattle, Pasco, Kelso and South Whidbey school districts — with a possible fifth averted the night before classes began in Spokane. The strikes weren’t all about money. But after settling more than 100 open contracts in Seattle and around the state, teachers will receive raises at levels many haven’t seen in recent years. That’s in part because teachers also received voter-approved cost-of-living increases that the Legislature had not paid for six years. Teachers in local districts then negotiated additional raises. The tentative agreement in Seattle, for example, calls for the district to add a 9.5 percent raise over three years on top of the 4.8 percent raise the state is providing over two years, according to the Seattle Education Association. That number didn’t budge much after the weeklong strike from what was on the table before teachers hit the picket lines. But the SEA told members they were receiving higher raises than all of the 15 other districts of at least 10,000 students in King, Pierce and Snohomish counties. Most contracts around the state were settled with minimal drama, like in Shoreline, where teachers negotiated for a 4.2 percent raise for this school year on top of the state’s raise. Districts have long added extra money to what the state provides for basic pay so they can compete with neighboring districts. But this year’s contract negotiations not only established new standards for competitive pay regionally, they also set the stage for what happens next in Olympia. Under the state Supreme Court’s 2012 McCleary school-funding decision, the state must pick up the full cost of paying teachers, not just a portion of it as it does now. Lawmakers struggled with that question in the last session, unable to agree on how to set a competitive statewide teacher salary and how to pay for it. And the raises teachers received this year make the gap even bigger to fill between what the state provides and what teachers are really paid. There’s broad disagreement in Olympia about whether taxpayers are already contributing enough overall to pay the competitive wages the court requires. Whatever solution lawmakers come up with not only has to pass constitutional muster, it has to be fair for each of the 295 school districts across Washington, which vary greatly in local wealth, cost of living and educational needs. But there’s agreement on one point: the way we pay Washington teachers is mind-numbingly complicated. On average, local districts are picking up about 23 percent of the total cost of paying teachers, though that varies by district and region, according to the Washington Association of School Administrators. In Seattle, for example, a beginning teacher would have to survive on $35,305 a year, based on what the state sends the district (and that’s including the new cost-of-living increase). If both sides agree to the new contract, Seattle Public Schools will add about $11,000 to that starting salary. Is $46,400 a year enough to persuade a recent college graduate to pursue a career in teaching? A legislative committee that studied that question recommended in a 2012 report that the state should pay beginning teachers about $48,700. Adjusted for inflation, that would be about $51,000 today, but either way, Seattle still comes up short. But that wasn’t the case for the state-funded basic pay, which was lower than in most other states. “What we found is beginning teachers are grossly underpaid,” said Stephen Nielsen, Assistant Superintendent of the Puget Sound Educational Service District and one of the report’s authors. Lawmakers have repeatedly said they’re not bound by that 2012 report. While the state Supreme Court agrees, it has also made it clear that it’s the state’s constitutional obligation to provide competitive salaries. “The state has offered no plan for achieving a sustained, fully state-funded system that will attract and retain the educators necessary to actually deliver a quality education,” the justices wrote in their latest order last month. Governor Jay Inslee has organized a bipartisan group of lawmakers to find a compromise, possibly before the full Legislature comes back in January. That’s why some think teachers unions had an incentive, especially this year, to get the best deals they could. The state teachers union, the Washington Education Association, flatly denies such a strategy, said WEA spokesman Rich Wood. He said that local unions around the state were fighting for other issues specific to their districts that addressed far more than money. Teachers in Seattle, for example, won more time for recess, a greater say in how often students are tested, the elimination of student test scores in teacher evaluation, and more involvement in assuring that student discipline is fair and effective. Wood said the strikes around the state will reverberate politically in Olympia. “Whether it’s in Pasco, Spokane or Seattle, it focuses the public’s attention on the need to invest in our kids’ education,” Wood said. It already has in Seattle, where a new parents’ group organized on Facebook surged to 1,400 members in three days during the strike and now has more than 2,000. The group focuses their frustration squarely on lawmakers. “The strike will definitely have an impact statewide because it will force us to realize that if we don’t do our job, there are going to be ramifications,” said state Sen. Kevin Ranker, D-Orcas Island, who both sympathized with the parents and supported the strike. Ranker said lawmakers also will have to consider other factors such as the reality that Seattle is a more expensive place to live than other areas. He wouldn’t support a plan that resulted in a pay cut for Seattle teachers. “That said, that doesn’t mean that teachers throughout the state are going to make that same amount of pay, even though they may deserve it,” Ranker said. Nielsen says the strikes this summer underscore a key contradiction in how Washington pays for education, requiring the state to pay for it, but giving school districts control over spending it.